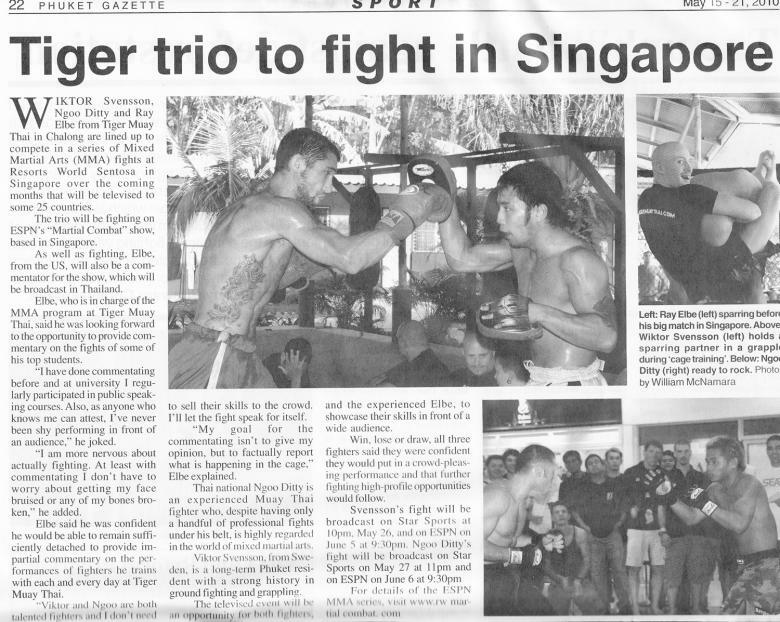 Phuket, Thailand’s leading English newspaper, The Phuket Gazette, highlighted Tiger Muay Thai and MMA fighters Ray Elbe, Wiktor Svensson, Ngoo Ditty, and David Gardener (Team Quest) as they headed to Singapore last week to fight in South East Asia’s MMA federation and ESPN / Star Sports MMA fight show: Martial Combat on May 12-13, 2010. Tiger MMA fighter Wiktor Svensson put his South Korean opponent to sleep in under 30 seconds with a nice under the arm guillotine choke leaving his opponent out on the mat as Wiktor celebrated his 2nd MMA win. Ngoo Ditty took on the reigning Philippine Champion and quickly tried to use his superior Muay Thai striking skills to hurt his opponent, but despite being a Blue belt in BJJ, Ngoo got taken down to the mat. Ngoo quickly tried to pull off triangle choke but was reversed and mounted and the referee stopped the fight with a minute remaining. David Gardener, fighting for Tiger Muay Thai and MMA out of Team Quest had one of the toughest fights of the two night MMA fight fest at the Sentosa Resort world casino in Singapore and pulled off a tough decision win over his Chinese opponent. In a special night of fights for the inaugural event of Martial Combat, Ray Elbe was a member of the color commentator crew calling the fight on ESPN.